Julie Ann Gardner, MBE (born 4 June 1969) is a Welsh television producer. Her most prominent work has been serving as executive producer on the 2005 revival of Doctor Who and its spin-off shows Torchwood and The Sarah Jane Adventures. She worked on Doctor Who from 2003 to 2009 before moving to Los Angeles to work at BBC Worldwide. Gardner was born in Neath, and grew up in the Pont Walby area of Glynneath where her parents ran a local shop. She attended Llangatwg Comprehensive and Neath Port Talbot College where she was an outstanding student of A level English, History and Drama. She read English at the Queen Mary College, University of London. She initially worked as a teacher at Rhondda College, now part of Coleg Morgannwg, teaching English GCSE and A-Level, before in the mid-1990s she decided to switch to working in the television industry. Her first job was as a producer's secretary on the second production block of the acclaimed BBC Two drama serial Our Friends in the North. Subsequently, she became a script reader and then a script editor, before working as a producer on BBC dramas such as Silent Witness and The Mrs Bradley Mysteries. In 2000, Gardner began working as a Development Producer at London Weekend Television. There, she produced dramas including Me and Mrs. Jones and an updated version of Othello written by Andrew Davies and starring Eamonn Walker and Christopher Eccleston (in the Iago role). While at LWT, Gardner began working with Welsh writer Russell T Davies on the period drama Casanova. In 2003, Gardner returned to the BBC as Head of Drama for BBC Wales, bringing Davies' Casanova project with her. Gardner's first assignment from BBC Head of Drama Jane Tranter was to head up the revival of Doctor Who. Gardner immediately contacted Davies (who had previously expressed an interest in writing and producing Doctor Who) and began working with him on bringing the programme back to British screens. The new series of Doctor Who debuted in March 2005, to critical and popular acclaim. Gardner was the BBC's representative in the production of the political romantic comedy The Girl in the Café (2005), written by Richard Curtis in conjunction with the Make Poverty History campaign. Other network dramas commissioned by Gardner at BBC Wales included the multiple personality disorder drama May 33rd (2004); domestic abuse-themed one-off Dad (2005); courtroom reconstruction The Chatterley Affair (2006) and the time travel police series Life on Mars (2006–2007), produced independently by Kudos Film & Television. Gardner and Davies also oversaw two Doctor Who spin-offs: Torchwood, an adult (post-watershed) science fiction drama aired on BBC Three and BBC Two, and The Sarah Jane Adventures, a children's fantasy thriller aired on BBC One and CBBC. In September 2006, it was announced that Gardner would succeed Jane Tranter as the overall Controller of Drama Commissioning at BBC Television, following Tranter's promotion to the new "Head of Fiction" role. However, Gardner remained in her position at BBC Wales, performing the two jobs simultaneously, until 2009; her roles at BBC Wales and with Doctor Who were then assumed by producer Piers Wenger. Gardner received credit for an increase in drama being made in Wales; in 2007, Cardiff-born writer Andrew Davies called her "the best thing to happen to Welsh drama. Ever." 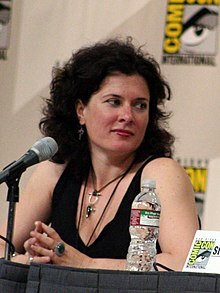 In March 2009, it was announced that Gardner was to join the staff of Los Angeles-based BBC Worldwide America, as executive producer in charge of scripted projects. It was announced in late 2009 that Julie was five months pregnant and her first child, Huckleberry, fathered by Doctor Who sound recordist Julian Howarth, was born in early summer 2010. ^ Entry Information. "FreeBMD Entry Info". FreeBMD. Retrieved 26 April 2015. ^ "BBC Vision appoints Gardner as head of drama commissioning". The Stage. 21 September 2006. Retrieved 21 September 2006. ^ Jones, Hannah (30 June 2007). "The power behind the". Western Mail. Trinity Mirror. Retrieved 2 July 2007. ^ Hemley, Matthew (4 March 2009). "BBC Wales' former head of drama joins Tranter's team America". The Stage. Retrieved 5 March 2009. ^ Price, Karen (10 September 2013). "Julie Gardner on recapturing the essence of Gavin & Stacey for an American audience". Lyon, J Shaun. Back to the Vortex. (Chapter Three: "The Executive Three", pages 42 and 43). Tolworth. Telos Publishing Ltd. 2005. ISBN 1-903889-78-2. Cook, Benjamin & Hickman, Clayton. Gardner's World. "Doctor Who Magazine". Issue 354. Cover date 30 March 2005. Pages 12–19.